The Long Lake Area Association's 2012 Annual Meeting will be Saturday, July 7th, at the Hubbard Community Center. Please come at 9:30AM for coffee, juice & rolls, registration, browsing informational displays and socializing. The meeting will begin at 10AM. Our two featured presenters this year are Mark Sommer, Hubbard Soil & Water Conservation District, on the Long Lake Water Quality Report and Doug Kingsley, MN DNR Area Fisheries, on dissolved oxygen and temperature monitoring. Door prizes follow the Neighborhood Elections. All are welcome. Check out the draft of the annual meeting minutes from last year on the Board Communications tab of this website. The Neighborhood 3 "Summer Saturday Morning Break" will be held June 30th from 9 to 11:30 AM at the Hubbard Community Center. There will be a complimentary continental breakfast, open house style, where you can come and go whenever it works in your morning schedule. Bring stories and pictures to share your lake history. Invite your neighbors and bring your cabin guests along. All are welcome! Neighborhood 3 includes those folks from the Hubbard Dam going East on Highway 87 and North on County 20 to 140th Street. Hubbard County is unique in that it crosses three watershed districts. They are the Mississippi Headwaters watershed to the north; the Leach Lake watershed covering the eastern portion and the Crow Wing watershed which includes the city of Park Rapids and southeastern part of Hubbard County. The bounded hydrologic system is where all living things are inextricably linked through common water communities and where we must become part of that community. Tri-Watershed Expo on Saturday, June 9, 2012 from 8:00am to 12:30pm at the Park Rapids High School. Wednesday, June 6th, is "Zorbaz Night" - an opportunity to get together with your Long Lake friends and neighbors. All are welcome to join this informal and varying group for food and fellowship. During summer Long Lake Zorbaz Nights are the first Wednesday of each month. 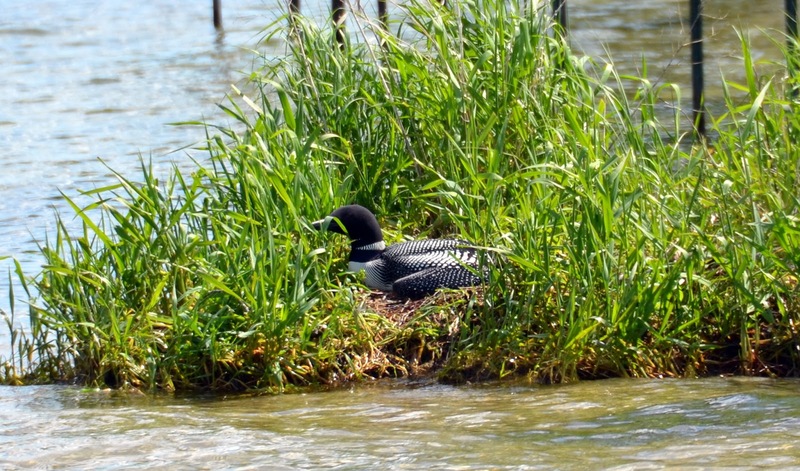 "We have a baby loon on the north end of the lake. 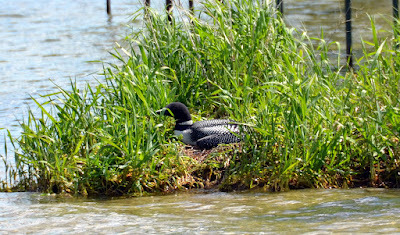 I'm attaching a picture of it and also the loon that is sitting on her nest down the lake by the purple martin nests." 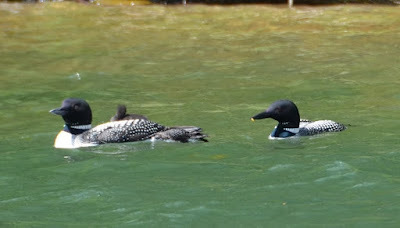 Thanks, Barb, for contributing to the blog.